Spis treści / Contents: INTRODUCTIONS: Jerzy Malinowski, On the Book; Paul Collinson, England’s Favourite Landscape: Paintings in Search of The Picturesque and Cautionary Tales of Landscape; Krzysztof Cieszkowski, Documentation of Modern British Art: Archives, Libraries and Bibliographies; POLISH –BRITISH ART REL ATIONS BEFORE 1945: David Bingham, Albert Lipczinski (1876–1974); Piotr Kopszak, Henri Gaudier-Brzeska’s “Polish” Identity and Contacts with Polish Artists; Izabela Curyłło-Klag, Poles in Wyndham Lewis’s Accounts of Early 20th-century Bohemia; Dominika Buchowska, Whitechapel Boys and the British Avant-Garde: In Search of the Polish Connection; Magdalena Zdrenka-Ciałkowska, The Art of Advertising in Poland and Great Britain. “Levitt–Him” as a Design Partnership; Waldemar Deluga, Polish Graphics from the British Collections (19th–20th Century); Irena Kossowska, The Insular Taste: The Art of England, Wales, Scotland and Ireland in the 1939 Warsaw; Maciej Tybus, The Art and Cultural Activities of the British POWs in Stalag XXA in Toruń; CONTEMPORARY BRITISH ART: Mateusz Soliński, Lucian Freud – The Body Painter; Małgorzata Stępnik, The Aesthetics of the The School of London “Diasporic” Painting – On the Basis of Ronald B. Kitaj’s Literary Manifestos; Maciej Gugała, “You Have to Be a Practitioner to Know This.” David Hockney’s Criticism of Art History; Karolina Kolenda, The Englishness of English Land Art – Richard Long and the Picturesque; Anna Markowska, Gilbert and George – A Double Author and the Space Between; Monika Szczygiel-Gajewska, Vision of Destruction by Cornelia Parker; Filip Pręgowski, The Recurrence of Modernism. On The Stuckists, the British Art Movement; Lidia Gerc, Future Systems – New Directions in British Architecture; Ewelina Kwiatkowska, Object, Sculpture, Installation – Contemporary Glass Art in Great Britain; POLISH ÉMIGRÉ ART IN GREAT BRITAIN AFTER 1945: Jan Wiktor Sienkiewicz, Polish Presence at Artistic Academies and in the Art of Great Britain after the Second World War. Introduction to Research; Małgorzata Geron, Henryk Gotlib. The Work in Poland and England; Malina Barcikowska Against the Grain. 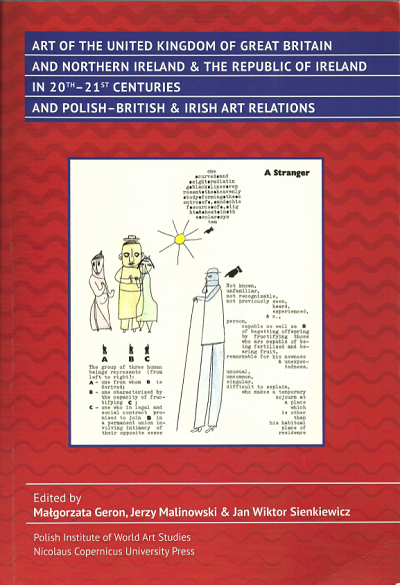 On the Relations of Franciszka and Stefan Themersons with the Circle of British Logicians and Mathematicians; Małgorzata Biernacka, The Continental British School of Painting – The Association of Polish Artists in Great Britain; Magdalena Howorus-Czajka, Tadeusz Piotr (Peter) Potworowski: An Analysis of Changes in His Art of the English Period in the Light of Art Criticism in Polish Émigré Periodicals; Agata Soczyńska, Marek Żuławski and Stanisław Frenkiel about Modern British Art; CONTEMPORARY POLISH –BRITISH ART RELATIONS: Piotr Marciniak, New Concepts of the City and Space. The Reception of British Architecture and Urban Planning in Poland in the 20th Century; Ewa Toniak, Moore in Auschwitz. Some Remarks Inspired by an Exhibition; Andrzej Jarosz, British Inspirations behind Wrocław Sculpture; Dorota Grubba-Thiede, “Mystery / Score-Poem” – Jerzy Bereś and Zbigniew Warpechowski in Great Britain in 1979 – The “Pilgrimage” around 11 Centers (Including Academic Ones) and a Question Regarding the Possible Impact of Jerzy Bereś on New British Sculpture Artists; Maria Hussakowska, Stranger in the City or Negotiator. Craigie Horsefield in Krakow; Anna M. Leśniewska, Colour and Light in the Art of Antoni Malinowski; Magdalena Zięba, Reception of Polish Art in Great Britain in the 21st Century. Exhibitions, Collections, Art Criticism IRISH ART: Katarzyna Kociołek, Visualising Irishness in Contemporary Irish Art ; Łukasz Guzek, How Connections with Ireland Inspired Polish Performance Art; Artur Tajber, Available Resources – Orient-Action / Dostępne zasoby – Orient-Akcja; Gail Prentice, Flax Art Studios, Belfast and Its Impact on Contemporary Northern Irish Art. Wydawnictwo Naukowe Uniwersytetu Mikołaja Kopernika, Toruń 2015 ISBN: 978-83-231-3438-1 (496 s.).